Also known as Myrtle, and an extremely popular evergreen groundcover. 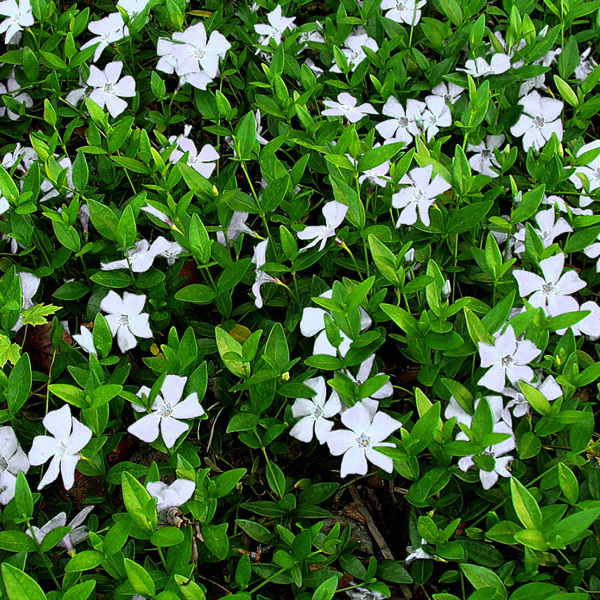 This less common selection forms a dense mat of glossy dark green leaves, studded with clean white flowers in spring. Very shade tolerant, the leaves will sometimes scorch in too much sun. Tolerates dry shade once plants are established. Stems root into the ground readily, and the new plants that form may be easily moved to a new location in spring or early fall. Mowing the patch low after blooming every couple of years will help to keep it thick and weed resistant. Plant 4 to10 plants per square yard.